When you enter the creative headquarters of Indian brand Vitasta in New Delhi, you would see a lady hustling through the corridors, from her desk to the design table and never stopping until all the immediate problems are dealt with. India based designer, Aditi V Dhar launched her leather accessories brand Vitasta in 2011 and today is one of the few rapidly growing accessory designer brands, who is running slow and growing strong in this competitive industry. 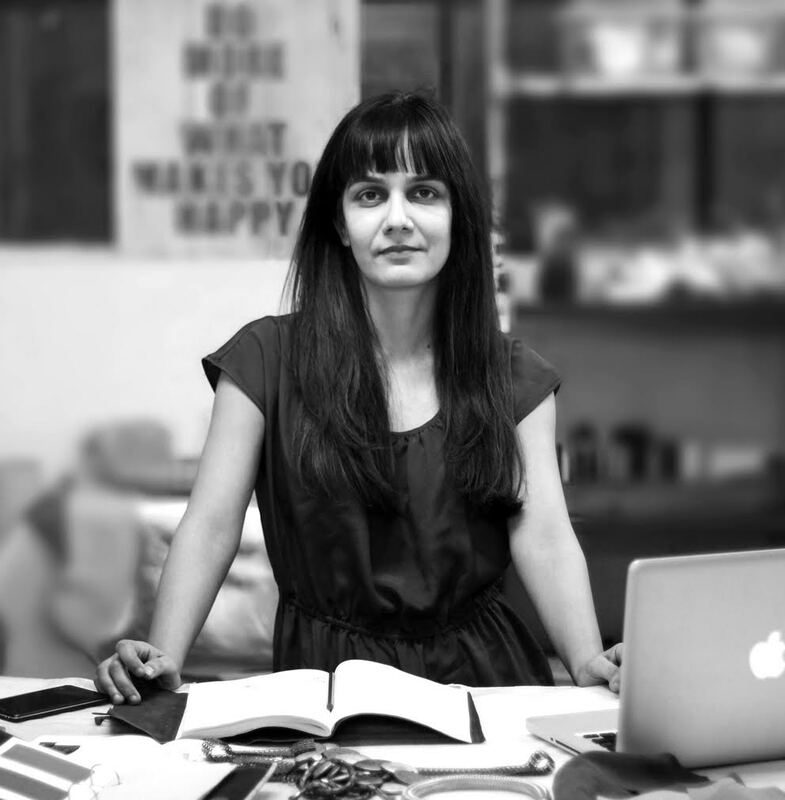 She completed a degree in Industrial & Product Design from The National Institute of Design, Ahmedabad. After that, she worked for prestigious brands like Wills Lifestyle, for whom she launched an accessory range, as well as Hi Design, the premium leather goods manufacturer. Utelier managed to catch up with her in between foreign trips and new collection launches and chat about the challenges of building a brand. When and why did you start your brand Vitasta? I founded Vitasta (Sanskrit word for the river Jhelum in Kashmir) in 2011. The brand came about from my understanding of what I saw in the market and what was needed in the accessory industry. At the time I realized there wasn’t any brand that focuses on modern contemporary designs and that is an epitome of quality in India. How is your brand different from other brands that sell the same products? While researching for my own brand, I realized that there was a gap in the domestic market. There are less, to an almost negligible number of brands here, which cater to everyday luxury. I didn’t find a lot of brands offering leather bags for women, especially made out of real leather. Even if they did, most of them were to be used for special occasions or focused on just the high-end scale of the market. So I wanted something which was more of an investment piece that was timeless and at the same time, extremely functional. Tell us about the feeling of getting your brand into stores. What was the experience like? We were at the Lakme Fashion week in India immediately after the launch of our first store in Bombay Electric in Colaba, Mumbai. But because the Indian accessory industry wasn’t as evolved as the apparel one, we were given a stall at the venue. That’s how we got our first store experience and today we are represented by 5 brick-and-mortar stores and online via our own website selling our leather handbags. We are also selling online via Amazon, Aha Life and many more outlets. What comes first in your design process – the idea of a shape or an inspiration source? Essentially, I keep my eyes open for inspiration since it can come at any time. Recently I took a trip to Bhuj in Gujarat and was really inspired by their technique and thread work which is in-line with our aesthetic. In such cases, I try to transplant the design or technique on my bags. Otherwise what I do is, I see a nice shape that I like and if we haven’t done something like that we develop it. We work with some ideas, which are from scratch, some we use techniques from elsewhere and put it on leather handbags that we are already doing. We don’t change our shapes that often. Did you face any hesitation from the international market with regards to acceptance of an Indian product? I don’t think so. Firstly because the name is not Indian sounding. Secondly, our leather handbags don’t look Indian. We don’t really do ethnic bags. Our customers know it’s made in India for the label is there. I’ve never had anybody say it’s an Indian product, which in any case shouldn’t be a problem as long as the product is of high-quality and serves its purpose. The manufacturing sector in India is a little unorganized. What challenges did you face in regards to setting up your brand? I didn’t face problems in getting people to manufacture since I had simultaneously set-up my own manufacturing unit (shut down in 2018). The challenge arose when I had to find resources for that factory. You are right in terms of India’s unorganized sector since the artisans are difficult to locate. Then you have to find the right merchandiser and production team. Further, finding quality suppliers, vendors and buyers, generating business from them, connecting with multi-branded stores; it took a lot of patience and leg-work, to begin with. Now what we are trying to do is, connect all the offline and online stores which have our collection and figure out a system in which we can maintain that and then grow the number of stores we are working with. So in that way, it was extremely time-consuming. What are the benefits of having your own manufacturing unit as compared to outsourcing production? There are two aspects to any brand. You grow the brand and you also grow the business. If you want to be a manufacturer as well as a brand that has its own products then your business model has to be set up in such a way that you can actually do both. Otherwise, you have to find vendors who would do that job for you and you focus on building the brand and its sale. It was beneficial only for the fact that logistics and time are saved. I am manufacturing my own goods so the miscommunication is dissolved since it is happening right under your nose. But now I realize, we might have to outsource our manufacturing needs soon. The idea is that you have to grow in scale and in order to do that, you have to grow your manufacturing and output. This is a very difficult thing to do. In having your own manufacturing unit you need to have more space, setup, people, machinery, running and operational costs. Everything becomes important. So the one thing you need to make sure happens when you scale-up, is to be clear on whether you want to increase the operational scale as well or not. How do you decide what price to sell your products? Is it a conscious decision or back-calculation? After you source all the materials and other accessories that go into the making of a bag, you add your fixed and operational costs along with your margins. But in the end, you need to also see from the customer’s point of view in that they should feel it’s value-for-money. Do you use spec-sheets? Is it a one-time process or you keep coming back to it all throughout the process? Yes, we do! We have a standard system for how we work. We have a prototype before it goes into production. There’s a spec-sheet which has all the details of the item. Once that spec sheet is complete, we also have another sheet called the production advice that we do. Essentially, if we were to produce an item, we would detail the things that require our attention. Because a bag has a number of components. You need it to understand many things like – what waste would be generated during production due to the raw material quality, how will the leather be skived and finished before the production happens, etc Additionally, we need to always keep quality control processes in mind, while the production is going on. Creating a spec sheet is a pre-production step for us. Updates to production can happen alongside creating the spec sheet. What is important is to remember to reflect any changes made in-line onto the spec. In fact, what should happen is, when the prototype is complete, the production sample should come up exactly as what is outlined in the spec pack. So whatever you have to make in the production, is what the spec and the production advice in our case, is about. It is very important for the end quality control. Tell us where you felt the turning point came in the evolution of your brand that was really a game-changer for you. The DNA of the brand came up three years ago when we really started focusing on the kind of products we want. The turning point came up a year and a half ago when we actually started getting traction in the market via our website. Then last year we won the Vogue Fashion Fund. It was a big validation for us in terms of the kind of work we are doing and also the way the brand was moving forward. What’s the most important thing to learn as a designer or a manufacturer? Designers have a tendency to not to look at the operational part of the business. We don’t’ look at costing or cash flow. Most designers are not trained to do that and most people don’t pay attention to it, which is why most of them run out of money. Creative people don’t tend to be business oriented much. You have to have a good financial knowledge, backing, and understanding of your place in the market. Once this is in place, the focus should be on marketing, because at the end of the day, marketing is key to attracting and reaching the right audience and selling your product. The other thing is obviously that you’d have to work very hard. There may not be profit in the beginning. Designers often focus on perfection, rather than on launching a good product, getting the feedback from the market, and then improving it. To what extent does this apply in your field? I absolutely agree with it. Your understanding of what works and may not work really comes out when you market it and see how people are reacting to it. So you should first know if your product is sound then you’ll have to see if the proof-of-concept is there. After both of those things are present, you can test it on the market. There isn’t any final stage of a product. The final stage is based on the product analysis you’ve gotten after you launch it and then refine it. It is often said that creative people are not really good at selling. How well does it apply to you? I had to learn that the hard way! As an entrepreneur, we must learn the tricks of the trade. It is all about that resonance of your brand personality and the mediums used to promote your brand. We started off with direct marketing, which includes email marketing via newsletters. Now, you are non-existent without having your brand presence on social media pages. So we run sponsored ads on Facebook and Instagram. Instagram is quite powerful for us. It’s very immediate, very visual and we get a lot of traction from it. Furthermore, we do a lot of pop-ups. Eventually, we’d have to expand to bigger spaces or do shop-n-shop. That’s definitely on the cards. What was the best advice you have received that has helped you in tough times? Persist and adapt, have passion, but have a clear head about your work as a business, and how to make it grow, as a business. What advice will you give someone thinking of starting their own brand? My advice would be, to look at the market carefully, find your customer and what they’re looking for. Given that fashion is an industry largely built on wants, figuring out your market position and having a clear strategy is key. Next articleWhat is “Pantone colour” and why is it important in fashion design?